The whispers are getting louder. Fine dining is out. Casual, simple and focused concepts are in. 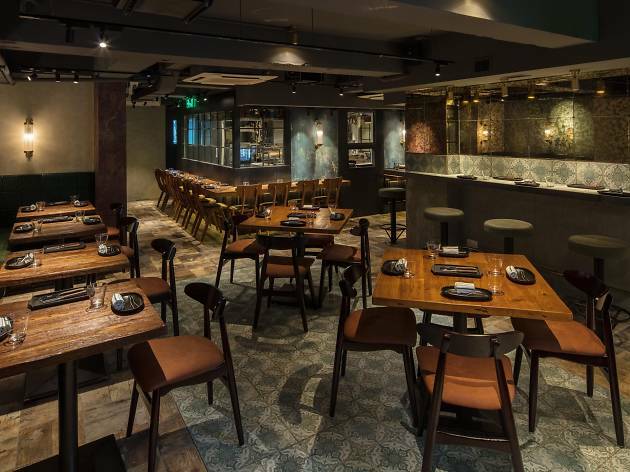 And here to help lead the movement in Hong Kong a meat bar simply called Meats. 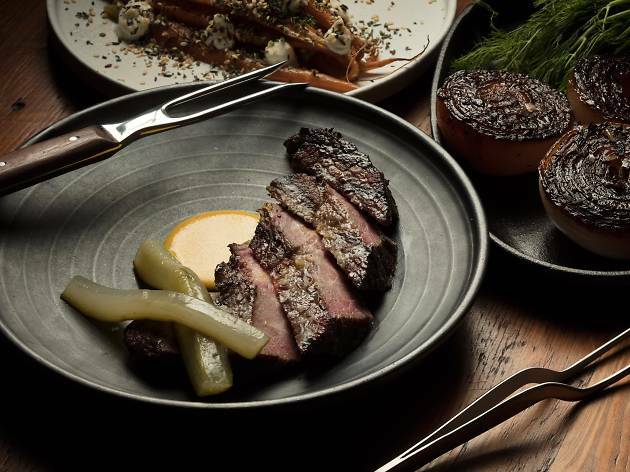 This carnivore haven is the latest offering from Pirata Group – the seemingly unstoppable group behind The Optimist, Pirata, Pici and TokyoLima. In fact, days after Meats opened, the group announced another single concept pop-up with meatball-centric joint, Balls. They’re onto something. Meats takes over the spot that was once home to the painfully mediocre Jaspas. 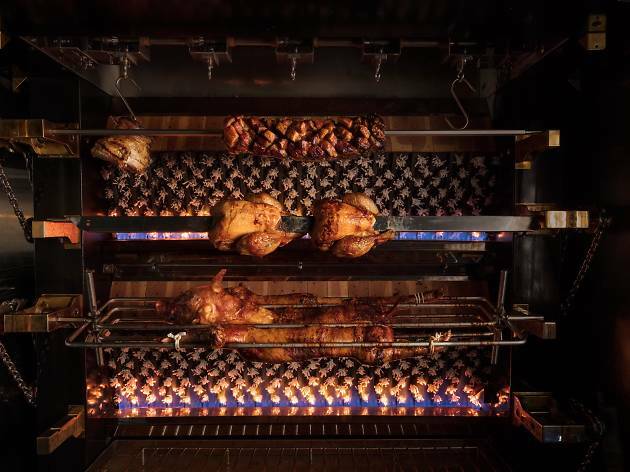 The no-reservations restaurant features a custom-made rotisserie and robata grill and heading up the kitchen is chef Paddy McDermott – a man who knows his meat. 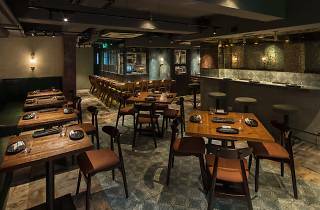 The restaurant's decor has an understated beauty – raw, rustic and exposed furnishings are countered by ambient lighting and a convivial atmosphere. We really love the open hatches onto the Staunton Street pavement that allow customers to sit both inside and outside. 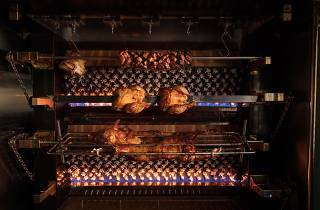 Cute hand-painted drawings of animals adorn the walls and the glass-fronted kitchen allows diners to watch the action without leaving the restaurant smelling like a hunk of grilled meat. The restaurant is busy so we take a seat at the bar, which isn’t usually the best seat when eating but feels fitting in this casual setting. The drinks menu is blissfully simple, with a few wines and beers and the only cocktails are old fashioneds, manhattans and whisky sours. The old fashioned is well balanced and mellow - just want we need before a meaty onslaught. Bartender Jack also informs us he thinks picklebacks are underrated in Hong Kong. We agree and the punchy double slammer of bourbon chased by pickle juice awakens our tastebuds. The menu, broken down into sections titled small, meats and sides and cutlery options featuring adorable mini carving forks and mini cleavers. We start with the chicken liver pâté ($140) served in a kilner jar with a side of lightly toasted brioche. The creamy pâté isn’t overpoweringly gamey and the topping of roasted cocoa nibs and PX sherry vinegar pearls provides crunch, pops, sweetness and enough acidity to cut through the butteriness of the pâté and brioche. It’s a genius combination of flavours and textures. 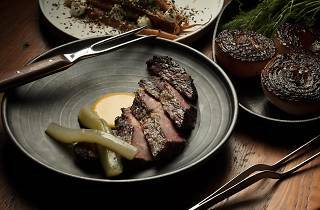 For mains, we go for the hangar steak ($160) and Iberian presa ($170). Both are 150g servings which looks small but is definitely enough, especially with a side of ‘slightly spicy’ fried rice ($65). The hangar steak is topped with a refreshingly crunchy jalapeno relish. The grassiness of the relish marries with the smoky steak, which is texturally spot on – meaty but tender. The presa is a beautiful cut, juicy and laden with umami, thanks to the black garlic and miso butter. The Sichuan crackling brings a satisfying tickle of mala and the rice – chopped chicken and beef with Sriracha mayo and topped with a fried egg is hearty and reminds us of kimchi fried rice. Filling as the meal is, we’re not in the predicted carnivore coma and the tarte tatin comes with bourbon ice cream ($90) so tarte it is. It’s a generous mini tarte as opposed to a meagre slice and the pear is delicately poached, still retaining some bite. The flakey base is buttery and the addition of sea salt flakes and caramel ice cream tie it all together to end a fantastic meal. Meats is spot on. Good portions of good food for good prices with a great vibe to boot. It may not be one for the veggies but it’s definitely one we’ll be sinking our teeth into again and again.